The Great Hollow is a location in Dark Souls and Dark Souls Remastered. A hollowed out tree with a series of twisting branches and roots leading down to a lower portion of the game. It's a relatively small area but made difficult by the perilous downward journey and tough enemies contained within. 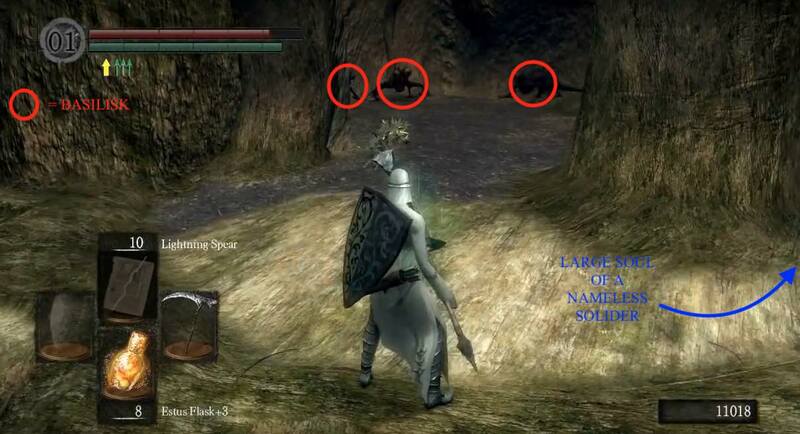 To access the Great Hollow, attack the two illusory walls at the top of a path on a giant tree root in Blighttown swamp. The area serves as the gateway to Ash Lake. To access the area head left toward the large tree from the Blighttown swamp bonfire and you should see a huge tree root going upward like a ramp that you can walk up. At the top, you can hit the wall to the left of the corpse (holding the Plank Shield) to reveal a secret area with a chest. Behind the chest you hit this wall too to reveal another secret passage leading down to The Great Hollow. As you continue through the narrow passage, down the ladder you'll find a bonfire, ensure you use it before continuing. In general there is only one direction to go - down - and doing so requires you to navigate a series of intertwined branches and roots which makes the details of the route difficult to describe in writing, so please excuse the limited directions. Figure out your route down through trial and error, and once you're familiar with it you'll find you can make your way down in no time. The area contains various forms of titanite (there is at least one titanite chunk of each color and there are even two of certain colors) and some soul items. The easiest way to find them all is just to explore, none of them are overly difficult to reach but almost every treasure in this area requires you to jump from one branch onto other branches or mushroom tops below. 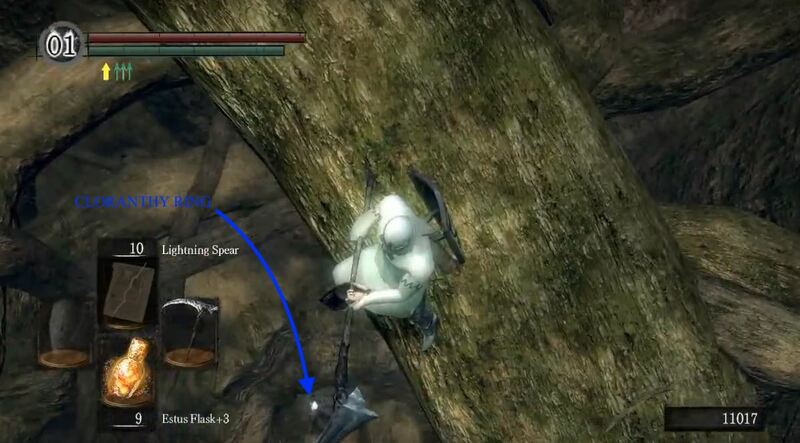 Also note, a total of 9 Crystal Lizards in the area, which seem to spawn randomly in various locations upon each bonfire reset - they are a great source of Twinkling Titanite and other forms of titanite. From the bonfire, as you go down the first root you can roll off toward the centre of the area and into the hollow tree below to get the Cloranthy Ring. Continue to proceed down the roots and you may come across an area with three Basilisks, before entering this area, find a Large Soul of a Nameless Solider. Survive them and continue down until you will reach a set of two ladders leading down further to a dense canopy of roots. There's two more Basilisks down here waiting for you but be careful when fighting them as the floor here has some holes that are easy to miss - you don't want to fall down. Below, there is another root canopy with four more Basilisks, but if you go to the edges of the holes on the canopy your on now, you can grab the attention of a couple of them who will then walk off the edge of their canopy to their death. Look near the base of the tree here and you'll find a ladder leading down, but there's also a hole nearby that you can drop down to collect an item. Down on the next level, be prepared to deal with the remaining Basilisks quickly. If you survive, look on the sides of the canopy for a root that slopes down and proceed down it to continue. Partway down, you will begin walking on large mushroom tops instead of branches and roots and will start encountering Small Mushroom People - they are not too much trouble. Further down near the bottom you'll see 3 Large Mushroom People as well as a few more small ones. 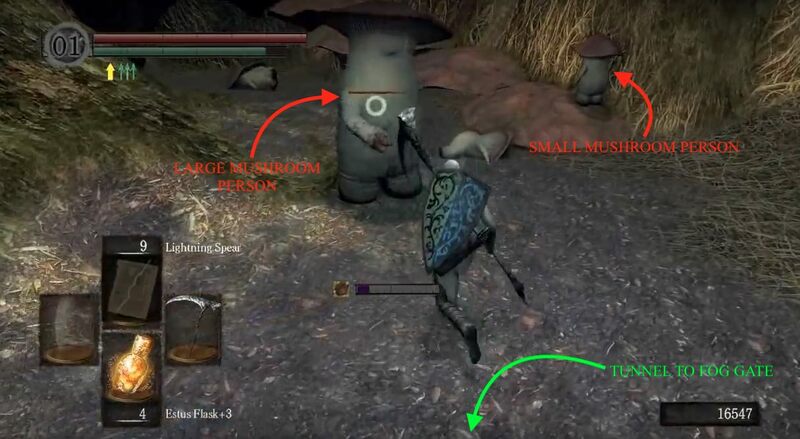 While they may not seem it, the Large Mushroom People can be very dangerous if they land a heavy punch; dodging their punches is the best strategy to defend against their attacks as they are slow and consume a large amount of stamina when blocked. If you followed the mushroom path all the way to the bottom, continue in the same direction and turn left into a tunnel, leading to a fog gate. Through this gate and to the end of the tunnel, you will arrive at Ash Lake. The spell fall control will make the jumps down the tree quick without much life loss, however any fatal jump with the spell is still fatal. I think I&apos;m retarded, I&apos;ve done multiple playthroughs and didn&apos;t even know this area existed until I tuned into Criken&apos;s randomizer stream. the 10 crystal lizards in this area. one on the right. one top right in cave. one in tunnel front. one in tunnel half way. three on ledge end of tunnel. one at criss-cross branch. two on ledge before first ladder. I have no idea how a first time player would find this place. I know It could be tough, but a map would be nice. Maybe done from a side view? There are 10 crystal lizards. I have gotten ten in all 3 of my last playthrus. Using Slumbering Dragoncrest and Ring of Fog really helps with catching the crystal lizards off guard, especially the four in the hidden tunnel above the first/highest group of basilisks. A little tip. When quitting out to respawn Crystal Lizards in the Great Hollow, you may need to quit out more than once to get them to spawn on your location. You can also get past that glitched branch area on the way up by backstepping over it. I find this to be 100% foolproof and not as scary as walking on air! Tested, confirmed on Remastered. 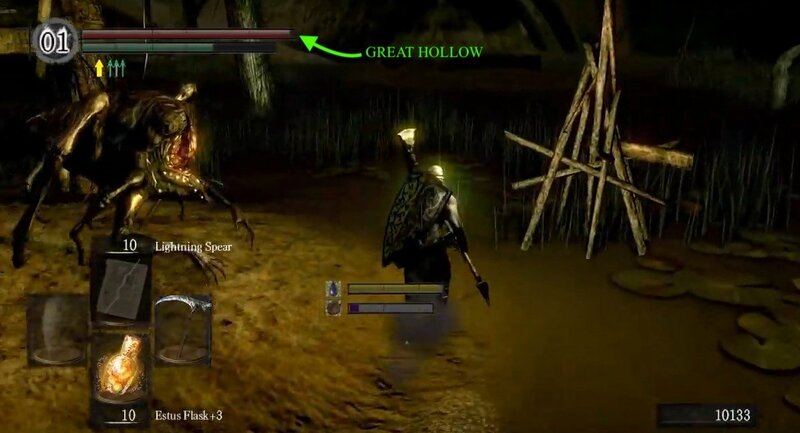 A warning for anyone playing remastered, the bug that stops you on the branch that leads back up to the bonfire has not been fixed so before going down to ash lake make sure you have homeward bones or the lordvessel to return back up or you can get stuck in the great hollow. If using homeward bones do not rest at any bonfires in ash lake.